When you get tired of eating same boring non-vegetarian food with lot of spices, masalas and panickingly too many ingredients, for a change you can try cooking non-vegetarian with a combination of vegetables. I prepared Chicken dosakaya curry this week. Actually i will never get tired of eating regular non-vegetarian curries.But the thing is we are on diet now. So we started eating Jowar Rotis for dinner daily. for the first few days it was like a hell eating them. we have a part-time cook. she prepares dinner for us. she is expert in preparing Jowar Rotis. She told me that “Jawar rotis tastes good when served with non-vegetarian gravy curries or any dal recipes”. so on every alternate day we eat non-vegetarian gravy curry cooked with vegetables. For that i use to pre-boil the meat to get rid of excess fat. but in the following recipe i didn’t pre-boil the meat. this type of recipes are good for elders.because this recipes very less spicy and easily digestible. For this Chicken Dosakaya curry you need to use Indian Yellow cucumber and taste it before cooking. if it tastes bitter, just remove the inner flesh and use it. but what i feel is, the real taste of this recipe depends on the inner flesh. because the inner flesh of the cucumber is little sour in taste. it gives a very special taste when cooked with any meat. by luck if is not bitter, just separate the inner seedy flesh, put it in the strainer and extract the juice by pressing it with the back of a spoon. you can cook the same recipe in Pressure cooker. it is better than cooking normally. you can use very less oil.For that you need to sauté onions,green chillies until soft,add ginger garlic paste,turmeric,salt,chilli powder,coriander powder then add chicken and cucumber pieces,chopped tomatoes,extracted cucumber juice,add some water,cover with lid and cook up to 3-4 whistles.wait until all the pressure is gone.then open the lid and garnish with coriander leaves and serve hot. you need to choose yellow cucumber for this curry not the salad one. peel off the skin from the cucumber. cut it into quarters and separate the seedy inner flesh and keep aside. taste the inner flesh.if it tastes bitter do not use it.just use the outer flesh. cut the outer flesh into small pieces and keep aside. heat oil in a pan, add finely chopped onions,green chillies and fry them till they become soft. add ginger garlic paste and saute until the raw flavor is gone. add turmeric powder,salt,red chilli powder,coriander powder and mix well. add chicken pieces,mix well,cover it with a lid and cook for 5 minutes on medium heat. after 5 minutes open the lid,mix it for once. add cucumber pieces,mix it well,cover it again and cook for 15 minutes on medium heat.mix in between. next open the lid ,add tomato pieces,extracted cucumber juice and mix well. and 1 cup of water and cook until the oil oozes out. 1.test whether chicken and cucumber are cooked properly.run a knife into a chicken and cucumber piece if it slides easily then they are cooked properly.otherwise cook for some more time. 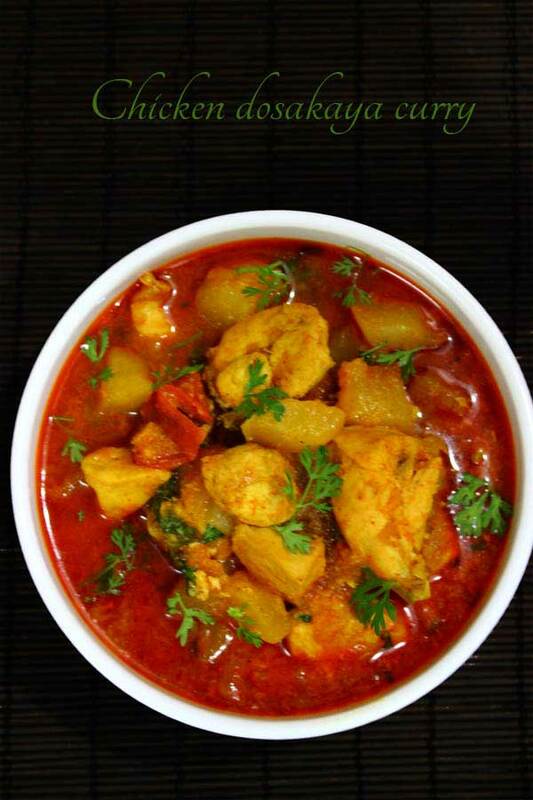 [br]2.tastes good when served with hot rice or rotis/phulkas.